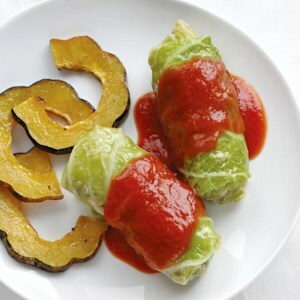 Find healthy, delicious stuffed cabbage roll recipes, from the food and nutrition experts at EatingWell. This 5-ingredient dinner recipe uses two genius hacks to make dinner healthy and get it on the table in under an hour. 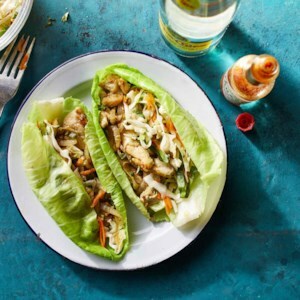 First, swap in cabbage leaves for tortillas to cut the carbs and get an extra serving of vegetables. Second, use prepared ingredients--spicy refried beans and enchilada sauce--to add tons of flavor without a long ingredient list. 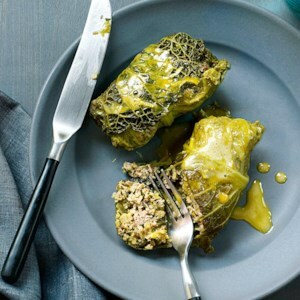 Lean ground turkey and brown rice seasoned with fresh dill and caraway seeds makes a moist filling for these stuffed cabbage rolls. They're baked in a combination of tomato sauce, lemon juice and honey for the familiar sweet-and-sour flavor typical of the dish. 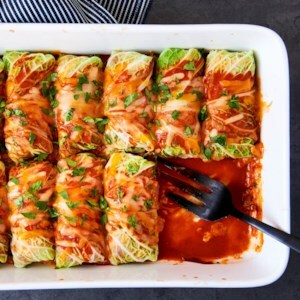 Though traditional stuffed cabbage recipes are made with meat, here Savoy cabbage leaves are stuffed with a combination of rice, mushrooms, onions, garlic and herbs for a healthy vegetarian stuffed cabbage recipe. 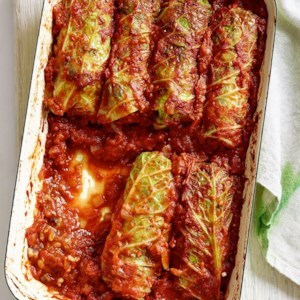 The stuffed cabbage leaves gently bake in a simple tomato sauce. This easy stuffed cabbage recipe can be made ahead of time and baked just before serving. 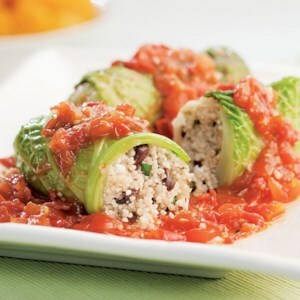 We love the subtle flavor of cinnamon with fresh mint in these vegetarian cabbage rolls stuffed with couscous, olives and feta cheese. 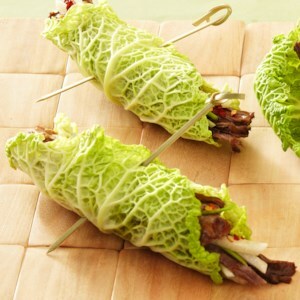 Don't worry if your cabbage leaves tear a little when you pull them off the head; they will wrap up just fine. As a precaution you can cook a couple extra leaves and roll two partly overlapping if needed. Serve with roasted butternut squash tossed with olive oil, cinnamon and garlic. To double this recipe, use 2 large skillets and prepare one 4-serving recipe in each.